After 2.5 years of being a working mom, I transitioned into being a SAHM when our second son was born. I was a nurse, so while I worked 3 instead of 5 days a week, I worked long hours. The days I worked, I took my son to daycare and then saw him for 5 minutes (and sometimes not at all) when I got home. I was lucky to stay home 2 days a week with him as long as I wasn't on call. But the transition from Working Mom to SAHM was definitely a learning curve while trying to do it with a newborn and toddler! As a working mom, my house was fairly clean but never spotless (unless people were coming over!). But it definitely didn't have time to get as dirty as it does when you have 2 kids destroying it all day long. In these 2 years, I've come to terms that I just cannot keep my house "visitor ready" at all times. As I type this, there's crumbs under the dining room table, breakfast dishes in the sink, random toys here and there, and a handful of crushed cereal on the floor in front of the tv. Mind you, we were gone all morning to the library and Children's Museum, so this mess happened in the hour from wake up to out the door. I have so much to do everyday, especially now that we have started homeschooling, that sometimes I don't really clean until the kids go to bed. Some of you may have to have a clean house at all times, even with small children in the house. Kuddos to you. As Type A as I am, I think my Type B husband has rubbed off on me in this area. We aren't living in filth by any means, but if I swept up Cheerios every single time they hit the floor, I'd get nothing else done every day! Some of you know what I'm talking about here! I'm an introverted person, so by default, I really like having alone time. When I worked, my commute was about 20-25 minutes in the morning and anywhere from 30 minutes to 2 hours sometimes depending on traffic! Needless to say, I got a TON of time to myself in the car on the days I worked. Big brother went to daycare as well. So if I got out early for some reason, I could run to the store sans kid before picking him up. I could grab lunch with a friend and then go pick up my sweet boy. As a SAHM now, it is me all day, all night every day of the week. My kids are pretty much always with me. I honestly think it's why I've become such a night owl. I've never really been a morning person, but when I tried waking up an hour or more before my kids, I was a zombie during the day. But staying up until midnight and waking up at 6:45am is totally doable. It gives me a couple hours after the kids go to bed (and the hubby too) to unwind and do things I need to do without interruption. I just make a larger cup of coffee in the morning! When our oldest was born, I was the breadwinner. Being a SAHM wasn't even an option so I didn't even really consider it. The idea popped up a few times in my mind as my maternity leave was running out, but seeing as my husband only had a part time job at the time, off to work I went. I was lucky to have worked 3 days a week, so I did get to spend 2 days during the week at home with our oldest when I wasn't on call. But there were also times I pretty much worked all week, including the weekend, and hardly got to see him. It wasn't until I started staying home full time that I realized I had missed certain things with my oldest that I didn't with baby brother. He walked for the first time at daycare. Big brother was a rather late walker (15 months old), so they didn't tell me until the next week when I said he started walking that he had done it Friday at daycare. Although I am grateful for the things he learned while he was there, it still tugs at my mommy heart-strings sometimes when I think about how much I missed that little boy those 2.5 years I was a working mom. Maybe it's just my personality, but I seem to thrive in the chaos. Which may also explain the types of nursing I chose to do as well. The chaos keeps me on my toes. I get so bored when we have sickness or something else that keeps us from doing things either around the house or outside. You can ask my husband, I'm really not good at just sitting and relaxing. If I'm sitting, I'm either online researching things, reading a book or working on the blog. We generally have a "routine" per se each day during the week, but we normally don't have any 2 days that look exactly alike. The biggest routine we have is probably our homeschool routine, but I usually switch things up some days just to keep things interesting. I'm not going to lie. Before I had kids, I really couldn't wrap my brain around what it was like to be a SAHM. I honestly thought I'd be bored out of my mind, my kids would drive me crazy, and I didn't have it in me to play every moment of every day. Cut to 2 years ago. I remember the first day after I put in my resignation at work while still on maternity leave and it was big brother's first day not in daycare. Honestly, I was petrified. How was I going to entertain these 2 all day long every single day for the foreseeable future? Was I going to be able to keep up with teaching big brother new things while I constantly nursed and held a very colicky newborn who hated sleep? It was so intimidating. These tiny humans were now under my constant care. Their ability to thrive was based on me and how I handled them. But you know what? I found a rhythm. They're kind and courteous little boys who tend to not give me too hard of a time. We have fun, learn new things together. Sometimes we have bad days and mom yells more than she should. But all in all, I had nothing to be afraid of. In the end, I still feel like I have things to learn as a SAHM. But I also think I have come a long way and have found a nice routine with the boys. Now if we add in another tiny human, things will get pretty interesting again. The difference then will be that I have full confidence in myself to handle what motherhood has in store for me! 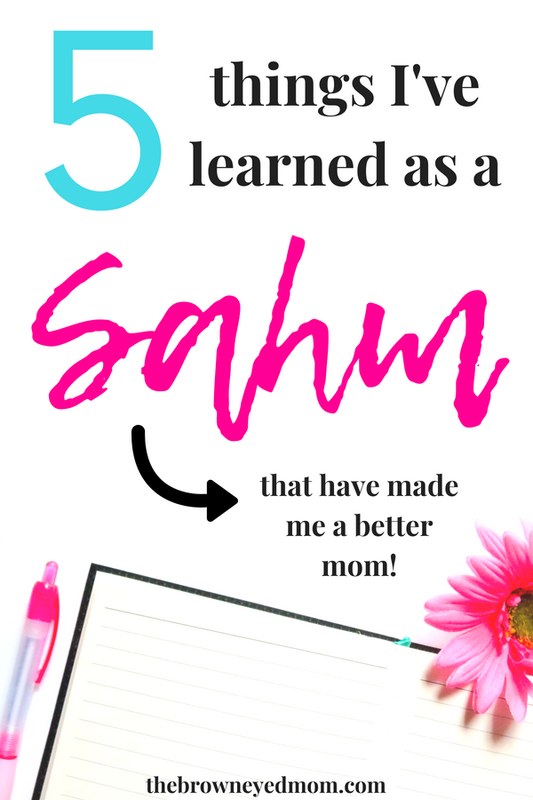 How are you adjusting to being a SAHM and what have you learned on your journey about yourself? If you like this post, be sure to share it and follow me on social media!